This collection of these French and adorable graphics is perfect for all your travel projects. 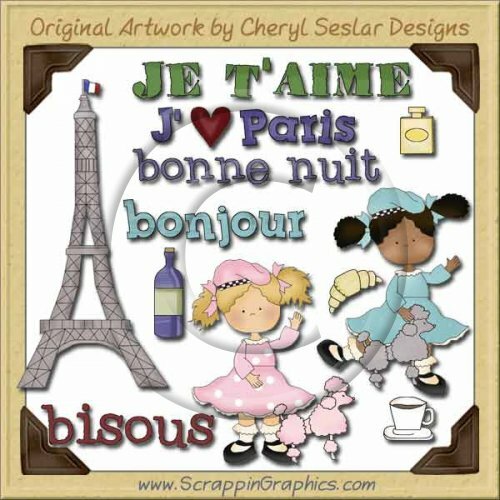 This set includes 12 different clip art graphics: Eiffel Tower, pink gal with poodle, J' HEART PARIS word art, perfume bottle, cup of cafe, BISOUS word art, African American gal walking poodle, croissant, bottle of wine, JE T'AIME word art, BONJOUR word art, BONNE NUIT word art. Great collection for making scrapbook pages, cards, labels, tags, invitations, and other printables.